The majority of accidents which occur in the home happen in the bathroom and include slips, trips, falls, and even drowning. 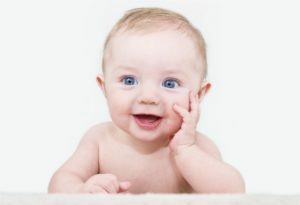 To help keep your infant safe, or if you are elderly or have elderly parents, take the time to review the following tips for making your bathrooms more secure and safe. Only fill the tub an inch or two with water. Babies could fall over and, if there is more water in the tub, they could drown. Always remember to check the temperature of the water your elbow or a baby tub thermometer. Water should be lukewarm, not hot or cold. Never leave babies unattended while in the tub. If you need to leave the bathroom for whatever reasons, always take the baby out of the tub and with you. All it takes is a few seconds for your baby to try to do something and get injured, like trying to get out of the tub. Secure throw rugs or remove them completely. Unsecured throw rugs are a leading reason why people fall in the bathroom. Secure them in place with double sided Velcro strips, use ones with slip resistant backing, or tack them directly onto the floor if possible. Use nonslip mats, tiles, or strips in tub shower units, and stand-alone showers and tubs. Make sure to rinse these off after bathing or showering to remove soap and prevent them from becoming slippery. Keep the shower and tub clean. Soap deposits can form on the bottom of the shower stall or tub and make slippery spots. Regular cleaning removes the deposits. 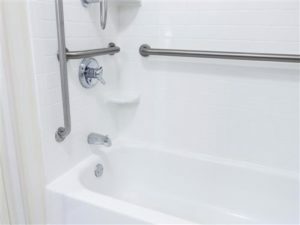 Install railings and grab bars in the tub, shower, and around the toilet, to make getting in and out or up and down easier. Make sure the bathroom is sufficiently lit and provides enough light. If the light levels seem too low, get new, brighter, natural lighting installed. Use a nightlight in the bathroom to make finding the light switch easier in the dark. If the toilet seems low, either get a raised seat or have the toilet raised. Never rush when you are in the bathroom. Allow plenty of time to do the things you need to do, and take your time. Accidents tend to happen when you try to rush. Use the vent fans and/or open windows to prevent condensation on the floors. Humidity from the shower or tub can cause condensation to form on the tile, linoleum, and hardwood floors, and could make these slippery. Install new tub shower units and enclosures with easy access features. If your current tub or shower is difficult to get into or out of, consider getting one with more user-friendly features. To learn more about shower and tub enclosures, bathtub wall surrounds, windows, and other bathroom accessories, call the experts at American Bath Enterprises, Inc. at (888) 228-4925 now.